We are entering an era where billions of devices will be able to collect and transmit data via the internet, so much so that Gartner recently forecasted that there will be 6.4 billion connected ‘things’ used worldwide in 2016. The hype around the IOT (Internet of Things) and smart technologies is building at a phenomenal pace, it has become the buzzword of all buzzwords within the t media and the bandwagon is set to keep on rolling, with everyone from car makers to home appliance companies hoping to ride on its success. Despite its hype, smart, connected products do represent a very real and practical step forward in how to connect disparate machines and widely dispersed data. As companies begin to understand the value of IoT, the focus will increasingly shift towards evaluating IoT technology via the underlying principles that guide most businesses today, focusing on improving productivity and efficiency and generating a return on investment. Commercial IoT solutions in the enterprise space will gain traction and businesses will be start to monetise the mass of data that IoT devices can provide. As the evolution of the physical security industry has shown us, consumer and IT technology has had a profound effect on driving innovation and change with the security industry, HDTV, H264 compression and Power over Ethernet being notable examples. With this in mind the Internet of Things is also set to have profound ramifications on the security and video surveillance industry. In 1996 Axis Communications introduced what many consider a pioneering IoT device (long before the term existed) when we launched the security industry’s first network camera. Little did we know it would ultimately spawn a tidal wave far beyond security. What we can be certain of is that the concept of network cameras has come a long way in 20 years. Yet if we were to rank the top emerging trends for 2016, connected systems would still have to be at the top. Why? Because the capabilities of IP-based systems are constantly evolving and suppliers of all types are still discovering new ways to leverage the power, flexibility and reach of connectivity. As more IP-based security devices inevitably replace aging analog systems, we will see wider use of security products that integrate the growing wealth of information generated by the IoT into not just information for security purposes, but a range of other applications and uses. IoT will allow network cameras to think independently and make smart decisions on their own. 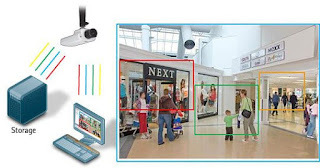 Imagine a mesh of network cameras that correspond between each other to alert the next camera of a person or object entering shortly from the left of a given scene. IoT-enabled cameras may also be able to cover up for one of their peers being damaged or obstructed. As enthralled as we are with the individual capabilities of IoT devices, in the security world the more important aspect of this trend is how all the components work together to solve a tangible challenge. First of all, IoT-based systems must be easy to design, install, maintain and use. And one size does not fit all. To maximise the potential of IoT, it requires an in-depth knowledge by suppliers who 1) understand how each feature or component works together, 2) can design a solution that can be used to solve specific challenges, and 3) are able deliver it as an integrated offering whose long-term value has more value than just the sum of its parts. This is especially true as security solutions move well beyond their roots in cameras. Indeed, largely because of IoT, the security sector’s traditional boundaries continue to blur. For example, network cameras can be used for Building Information Management (BIM), Business Intelligence (BI) in retail and even leaping into scientific research with real-time analysis of traffic patterns and crowd movements. IoT will allow for combined systems integrating previously disparate devices such as video surveillance cameras, smoke detectors, access control panels and loudspeakers into a common management console providing a ‘single pane of glass’ overview across entire buildings and sites. Axis Communications itself is branching out and has introduced IP-based loudspeakers and door controllers, for example, enabling not just an Internet of Things, but a step towards truly smart buildings. New technologies and methods for enhancing cyber security specifically for networked and cloud-based security systems are emerging. This is critical to protect against vulnerabilities, such as hacking, and will be an important aspect of how physical security and surveillance solutions are designed and implemented. Cloud-based computing has touched just about every industry and it will continue to reshape the security and surveillance sector as well. Security can now be offered as a service that is managed remotely, freeing up valuable human and capital resources that no longer need to be on site at every location that requires monitoring. Secure remote access to security systems will increase in use, including by end users who want the convenience and real-time benefits of being able to monitor property and events without having to be physically present. According to market researchers, video is now the fastest growing type of data in the world, and video generated by security and surveillance systems is no small reason. While this vast amount of video data is largely being used for security purposes, as mentioned above, it is increasingly valuable as a source of business intelligence. However, there still remains a significant challenge to effectively manage and use the endless amounts of video data being generated, so-called big data. Big data is difficult to process through traditional data processing applications. We expect to see more investment in tools and other resources that can effectively mine and derive actionable intelligence from the big data that security systems are producing. This technology can put structure around vast amounts of unstructured video data, helping better understand significant patterns and trends. In the coming years, look for improvements in and greater use of video management systems (VMS) to search big data in order to pull up relevant events, people, locations, times, colors and keywords. Such tools will assist business operators to turn big data into critical information that aids in loss prevention, marketing, operations, and customer service. Wireless technology has transformed our lives in many ways, from mobile phones, to WiFi connectivity. We have already seen the benefit and convenience of remote security monitoring via smartphones and tablets. Video surveillance systems of up to ten network cameras can be managed entirely via mobile devices, no longer requiring a desktop PC to run video management software. Especially for SMBs, this significantly lowers the technology hurdle as users are more open to using a smartphone app than having to overlook a more comprehensive and detailed video management software on a desktop PC. It also reduces overall system and maintenance costs. Expect to see more use of wireless technology in security and video surveillance, particularly as an enhancement to business optimisation and improvement of the customer experience. Security operators have an insatiable appetite for more clarity and detail in the images produced by their video surveillance systems. This is especially true as the adoption of intelligent video analytics continues to grow. So continued improvement in megapixel technology is certainly in our future. Enhanced techniques to handle challenging low-lighting conditions in new ways are coming to market, making cameras even more useful in a wider array of applications and use cases. These improvements, largely focused on expanding the wide dynamic range (WDR) capability of cameras, also provide enhanced detail for analytics to help decipher information. Look for continued adoption of 4K Ultra HD, which enables network cameras to see more details. With an HDTV or megapixel network camera, the resolution is at least three times better than an analog CCTV camera. And 4K Ultra HD offers four times the resolution of HDTV 1080p. However, higher and higher resolutions also result in increasing storage consumption. Intelligent video compression algorithms such as Axis’ Zipstream technology allow for a reduction in storage needs by an average 50% or more. This is achieved by analysing and optimising a network camera’s video stream in real-time. Scenes containing interesting details are recorded in full image quality and resolution while other areas are filtered out to optimally use available storage. Important forensic details like faces, tattoos or license plates are isolated and preserved, while irrelevant areas such as white walls, lawns and vegetation are sacrificed by smoothing in order to achieve better storage savings. If IoT devices are the eyes and ears for increasingly interconnected systems, then analytics technology is the brain. We expect to see continued adoption of sophisticated video and audio analytics in the coming year, helping security systems evolve from passive monitoring to intelligent and adaptive recognition, situational awareness and analysis systems. Analytics go far beyond security uses. Retailers, for example, are increasingly using video analytics to gain business intelligence insights that allow them to optimise shop floor plans, merchandise display or checkout queue management. In our recent survey, ‘CCTV in Retail’, one third of retailers across Northern Europe want better customer insights such as age and gender analytics and other IP applications such as people counting, queue management and dwell time. This opens up entirely new user groups to video surveillance. For example, in-store traffic flow and behavior analysis can help guide advertising and promotion campaigns. While the vision of IoT is enticing for the convenience, capabilities and flexibility vast networks of connected devices offer, there is a growing risk for security threats and breaches as the number of entry points into a network dramatically increases. In a recent survey by Cisco, 73 percent of business decision makers said they expect the IoT to cause security threats to increase in severity over the next two years. More worrying, 78 percent of IT security professionals are either unsure about their capabilities, or believe they lack the visibility and management required to secure new kinds of network connected devices. As a general rule of thumb, as you increase availability and access to any network device, it potentially increases exposure to cyber threats. Because security camera systems will become increasingly internet connected with the rise of the Internet of Security things, offering benefits such as remote access and third party integration, just as with other network connected devices, it is critical to do a risk assessment and implement security polices in the design and implementation of a network video system. Risk assessments have been common practice in the design of physical security systems for years, particularly for enterprise installations. Integrators should apply the same thought process to the configuration of network video devices, even though unlike other devices on the networks such as laptops, desktop or mobile devices, a network camera is not exposed to the common threat of users visiting potentially harmful websites, opening malicious email attachments or installing untrusted applications. However, as a network device, a camera or other connected physical security devices may expose risk. Consequently it is important to reduce the exposure area of these risks and minimising the attack surface area is a common cyber protection measure. If devices, services and applications do not need to interact you should try to limit connectivity between them. Additionally segmenting the video system from the core network is a good overall protection measure, thereby reducing risks of video resources and business resources adversely effecting each other. The process of securing a video security system – or hardening it – is an increasingly necessary one for installers and IT personnel to understand. A good hardening guide provides a configuration strategy suited to specific user requirements to deal with the evolving threat landscape. Axis uses the SANS Top 20 Critical Security Controls as a baseline for its hardening guide. A first step is an understanding and use of industry standard security protocols, including multi-level user authentication/authorisation, password protection, SSL/TLS encryption, 802.1X, IP-filtering and certificate management. In addition, smart camera suppliers like Axis continuously update their cameras firmware with new features, bug fixes and security patches. To deal with the increasing risk, variety and volume of security risks, security systems users will need to stay on top of updates from their suppliers and take heed of best practices for preventing attacks through network camera-based systems. Article originally published by IFSEC Global on 2/4/16. The acquired data can let dealers be well prepared for discussing the deal conditions and to determine their potential acquirers beforehand. Better control As opposed to physical storages , which supposed that the responsible staff had to permanently control providing the right documents to the right party , VDRs allow performing this setting once and for long .